This post was originally published on April 21, 2008. The Minxes love dim sum and this weekend we tried something new: Taiwanese dim sum from A & J in Rockville. Our favorite Hong Kong-style dim sum at Jesse Wong's Hong Kong features multitudinous dumplings along with seafood, noodles, and vegetable dishes. Taiwanese dim sum is quite a different animal. A & J's menu was heavy on fried things and noodle soups, and not a shred of seafood was to be found. The thing that looks like a rolled-up wash cloth is actually a roll of glutinous rice filled with beef. It was somewhat like sticky rice in lotus, except the rice was firmer and the lotus was replaced by a sheet of plastic wrap. 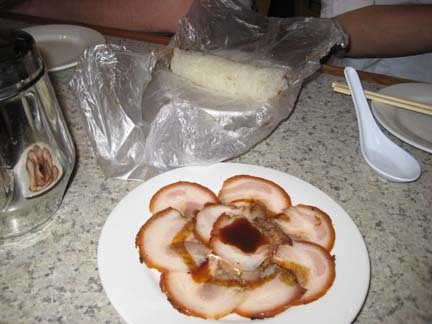 The other plate has thin slices of cold pork belly with a soy-based sauce. Two versions of beef and Chinese turnip noodle soup, one with thick noodles (that reminded me of the storebought Polish kluski my grandmother made once in a while, very firm to the bite) and one with thin. The turnip was pickled, and added a piquant flavor to the broth. 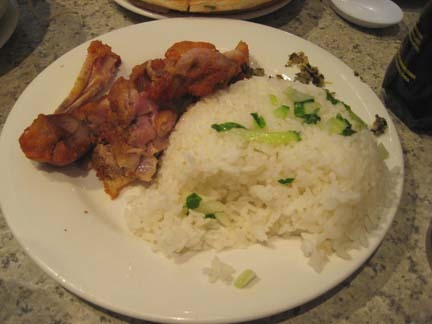 Chinese fried chicken with sticky rice. The greenish stuff behind the rice was chopped greens of some sort (mustard?). The chicken was outstanding. 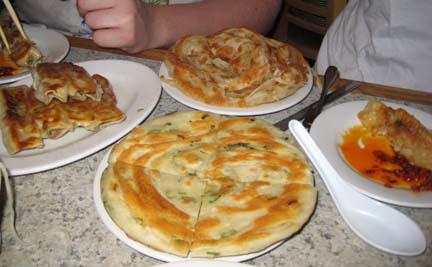 Foreground: Scallion pancakes that were piping hot, multilayered, and crispy good. Behind the scallion pancakes is another sort of flaky wheat pastry/bread that would have been good with some cinnamon and icing but was otherwise difficult to eat and somewhat bland. To the left is a plate of pot stickers. 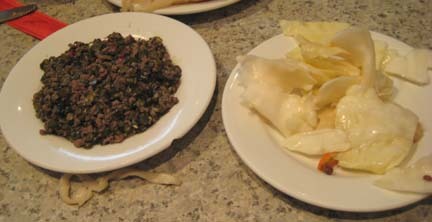 Two pickled dishes: long beans with ground beef, and cabbage. The long beans were cut up very finely, and the flavor of the dish was not at all what I would call "Chinese" or even any sort of Asian. There was a spice in it that reminded me of caraway seeds, so I had the impression of eating a Reuben sandwich (I have a good imagination). MinxBrother thought it was more like a Middle Eastern dish. 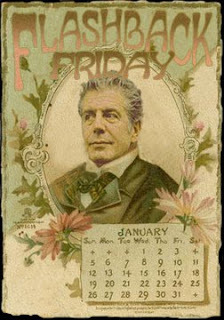 In any case, it would make a fabulous empanada filling. The cabbage tasted of Western pickling spices, and there were peppercorns visible among the pieces of veg. It wasn't sweet, unlike the pickled cabbage they sometimes serve at New Han Dynasty.